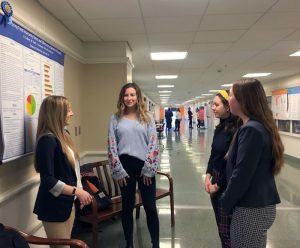 For the fifth straight year, Syracuse University Sport Analytics and Sport Management students participated in the Society of American Baseball Research (SABR) Analytics’ Diamond Dollars Case Competition in Phoenix, Arizona, over Spring Break in March 2019. 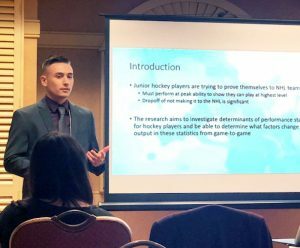 The competition is for undergraduate and graduate students from universities across the country to compete against each other by researching and presenting on a current baseball analytics topic. Presentations were made to a panel of judges consisting of Major League Baseball executives. Five SU teams competed in Arizona in 2019, with two teams winning their respective divisions. The topic was “Developing a Strategy for Pitching Usage,” and teams were tasked with defining a strategy (or multiple strategies) that MLB teams can follow to assess the optimal way to deploy their pitching assets over the course of a 162-game schedule. Teams had to show how their strategy would impact team run prevention and ultimately team performance. Teams made their presentations by using programs such as R, Excel, and Tableau. With the help of generous gifts from Mark Lomasky and Andrew Berlin, 25 students competed at this prestigious event. 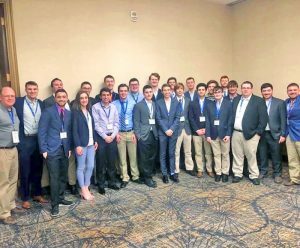 The competition is part of the annual SABR Analytics Conference in Phoenix, which featured industry speakers, as well as a networking event and job fair for the students to engage with executives who work in the baseball analytics field. Students attended spring training baseball games and an Arizona Coyotes game. They met with members of the Arizona Diamondbacks’ business analytics team, including SPM graduate Greg Ackerman ’15. 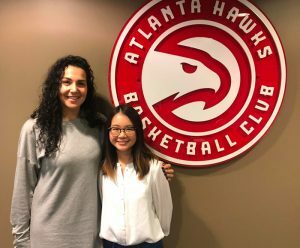 The students were accompanied by Sport Analytics professor Dr. Rodney Paul, Sport Analytics program manager Francesco Riverso, and Sport Management assistant teaching professor David Meluni. The Baseball Statistics and Sabermetrics Club meets every Wednesday at 6pm in Falk Room 400. Email Dr. Paul at rpaul01@syr.edu for more information. Calculating the Future of Sports Through Analytics is the featured theme of the First Annual Andrew T. Berlin Sport Analytics Symposium. The event will take place in Chicago on April 3, with a keynote address by Chicago Cubs Senior Vice President of Player Development and Amateur Scouting, Jason McLeod. 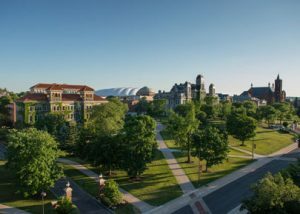 Analytics professionals from the Chicago-area sports industry and Syracuse University faculty members will take part in a panel discussion and Q&A exploring the innovative ways sport executives are turning to analytics to boost team success. The event is made possible by the generosity of Syracuse University Trustee and alumnus, Andrew T. Berlin ’83. Berlin is the Partner Investor of the Chicago Cubs, Chairman and Owner of the minor league Cubs affiliate, the South Bend Cubs, and Chairman and CEO of Berlin Packaging. The annual Berlin Symposium will feature leading innovators in sport analytics and hosted at sites across the country with panels of local industry executives and Syracuse University sport analytics professors. To learn more about the April 2019 lecture, visit the event registration page. 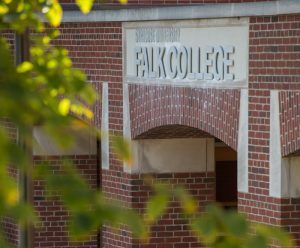 Falk College’s bachelor of science in sport analytics provides students with a deep understanding of math, statistics, research methodology, sport economics, database management, finance, and computer programming. The degree incorporates a mandatory foreign language requirement to prepare students for the global sport in a variety of different possible analytics career paths on the player evaluation side, business side, or both. 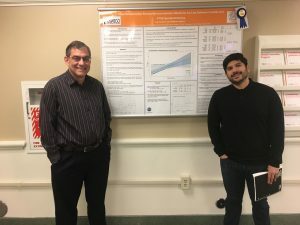 Also, Sport Analytics senior Cody Barbuto presented his research on “GINI Coefficients in the NBA” and Sport Analytics associate professor Dr. Shane Sanders presented his research titled “Around the World: Rating Professional Basketball Player and League-Quality by Estimating Player Win-Value Changes across Leagues” at the conference. Syracuse University Sport Analytics professor Dr. Rodney Paul served as a judge on the competition panel. Paul and Sanders served as faculty mentors to Riccardi and Barbuto in their pre-conference research. The students interview former Syracuse linebacker Cameron Lynch, senior captain in 2014, who now plays for the Tampa Bay Buccaneers in the NFL. Photo courtesy of Deninger. 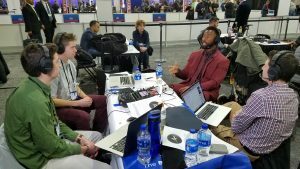 With help from Falk College professor of practice, Dennis Deninger, and the Orange alumni family, three Syracuse University students made their way to Atlanta and covered Super Bowl LIII Media Week. 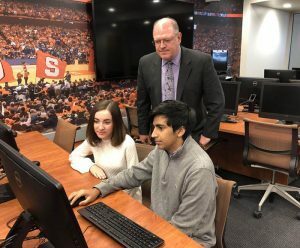 Read more on the SU News website and in the Daily Orange.